2017 was another strong year in the Fire Island real estate market. The island wide average recorded sale price as of December 22nd was $800,077, which is nearly even with 2016’s average sale price of $804,581. 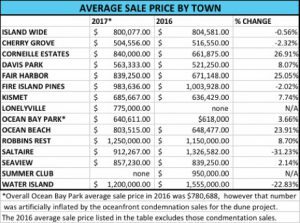 Several Fire Island towns saw huge year over year price growth, including Ocean Beach, where prices increased 24%, Corneille Estates, which saw a year over year increase of 27%, and Fair Harbor which saw a 25% increase in average sale price. Ocean Bay Park and Seaview saw more modest price growth at 4% and 2%, respectively. See the table below for average sale prices by town. Please note that there is a data recording lag of up to 90 days, so not all 2017 transactions have been recorded yet. The figures below represent all reported data as of December 22, 2017. We will issue a comprehensive market report in the first quarter of 2018 that will have complete 2017 sales data.